Hanoi Rocks was a Finnish glam rock band formed in 1979. Their biggest success was in the early 80s. They released five albums, including their 1984 major-label debut Two steps from the move (on CBS), during their original run. Hanoi Rocks broke up in April 2009. 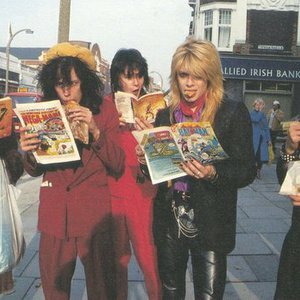 Hanoi Rocks is one of the First finnish bands to achieve international success, being huge especially in Japan. Guitarist Andy McCoy and vocalist Michael Monroe reformed the band in 2001, and in the same year they released the album 12 Shots on the Rocks. Hanoi Rocks broke up in April 2009. Hanoi Rocks is one of the First finnish bands to achieve international success, being huge especially in Japan. Guitarist Andy McCoy and vocalist Michael Monroe reformed the band in 2001, and in the same year they released the album 12 Shots on the Rocks. The other band members have changed in the past few years, with Michael and Andy being the backbone of the group. The current line-up includes two former members of Electric Boys, including Electric Boys' singer Conny Bloom on guitar. Musically the band is influenced by artists such as MC5, The Stooges and The Rolling Stones. Their music fuses elements of blues, punk, garage rock, glam rock as well as the original rock 'n' roll of Chuck Berry and Little Richard. Lyrical themes revolve around the topics of love and its trials and tribulations, and suburban alienation. The group is sometimes mistaken as glam metal, largely due to their image, which many of the American acts in the 1980s would imitate. Musically however, Hanoi Rocks are not part of that movement nor were they influenced by heavy metal. Hanoi Rocks is cited one of the most influential Glam metal band of all time, in Metal: A Headbanger's Journey document movie (2005). Hanoi Rocks was formed in Helsinki in 1979 and the first line-up included vocalist and saxophone player Michael Monroe (Matti Fagerholm), guitar player Nasty Suicide (Jan Stenfors), guitar player Stefan Piesnack, bass player Nedo and drummer Peki Sirola. The following year Piesnack, Sirola and Nedo were replaced by guitar player Andy McCoy (Antti Hulkko), bass player Sam Yaffa (Sami Takam?ki) and drummer Gyp Casino (Jesper Sporre). In 1981 they moved to Stockholm and in 1982 to London to take advantage of the livelier music scene in these cities. Later that year Casino was fired and replaced by Razzle (Nicholas Dingley). Although the band never gained significant commercial success, they have a considerable cult following and critical acclaim for their 'sleazy' yet melodic style of music. They have been cited as an influence by major bands such as Guns N' Roses and Manic Street Preachers. The re-release of Hanoi Rocks' albums on CD was in large part due to efforts by Guns N' Roses via their own record label UZI Suicide. In Finland, however, Hanoi Rocks is known as the Finnish rock band who at their time had come closest to real international fame, only much later giving way to such groups as HIM. In 2002 Monroe and McCoy reformed the band, with two members of the Electric Boys, and a drummer who had previously featured in Monroe's solo project. They have released two new albums and toured heavily since then. 2005 and beyond: Nasty Suicide works as a pharmacist. Sami Yaffa now plays in a band called Mad Juana with his wife, Karmen Guy, and is based in New York City. Yaffa is also touring and recording with the reformed New York Dolls. Suicide and Yaffa have appeared onstage with the reformed Hanoi although not at the same time. The single "Fashion", released in May, went straight to #1 in the Finnish singles chart. On the 8th of August, a the single 'This One's For Rock'n'Roll' was released to be downloaded from selected sites. This was featured on the album 'Street Poetry', which was released early September 2007. In October 2008, the band announced that they will be splitting up for good in spring, 2009. The band will play their farewell tour in Japan and end their career with a gig in Tavastia, Helsinki where they originally started playing. According to Mike Monroe and Andy McCoy, the band has reached its full potential now and has gone as far as it will ever go.